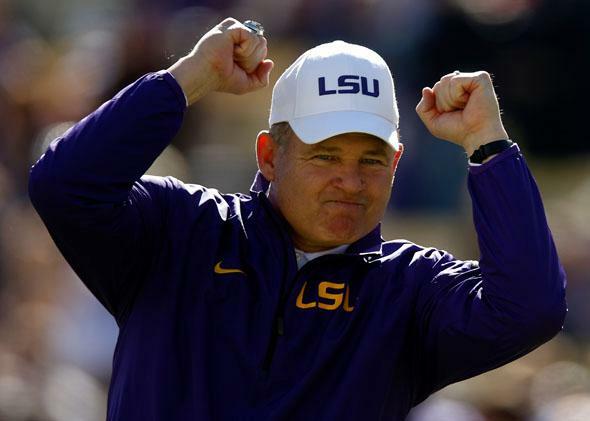 Les Miles, baseball stats: The LSU football coach explains sabermetrics, for some reason (VIDEO). LSU football coach Les Miles explains advanced baseball statistics, for some reason. A few weeks ago, the football coach extended his range a bit, sharing his thoughts on baseball’s statistical revolution. On the show Inside LSU Football, Miles and host Gordy Rush discussed a recent “LSU Night” hosted by Major League Baseball’s Houston Astros. As I previously discussed on Slate’s weekly sports podcast Hang Up and Listen, Miles used this as an opportunity to talk about modern-day pitch-tracking technology. Yeah, we really enjoyed that visit. We found out that every ball was documented, every pitched ball from the mound to the plate in what is Major League Baseball is documented and categorized—and this one is a slider, it breaks this far, this is a fastball it does—and what they’re doing is they’re deciding and figuring out what really makes a pitch a difficult ball to hit. And they make a couple of great points. They live in outside-the-box decision-making that they put a formula and a calculation to. And I really enjoyed it. A bit later, Miles muses on OPS, the baseball statistic that describes … well, I’ll let him explain it. The idea that they have an on-base percentage and a slugging percentage and they make it one statistic. I mean, that to me kind of says that, that guy gets on base and when he doesn’t, when he’s not just getting on base he’s hitting the ball long. So, that combination, that statistic, is maybe something that everybody should look at. It’s easy to mock Miles’ elocution, but he’s not wrong about any of this stuff. MLB’s pitch-tracking tech is very cool, and someone with a high OPS is indeed getting on base and hitting the ball long. And who doesn’t love combining statistics? Given the coach’s newfound interest in sabermetrics, I expect to hear the following questions after Saturday’s football game between LSU and New Mexico State. Why did you start Anthony Jennings over Brandon Harris? Do you prefer the FanGraphs formula for WAR or the Baseball Reference version? Is Derek Jeter really an all-time great given that his DRS and UZR are off-the-charts terrible? Who’s going to start at middle linebacker against Auburn?